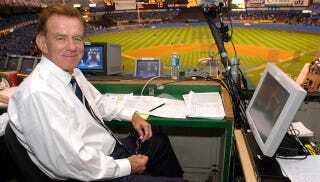 Today, sportscaster Tim McCarver was named the winner of the 2012 Ford C. Frick Award in honor of his "broadcasting excellence." The Baseball Hall of Fame is hosting a conference call with the honoree at 11 a.m. ET. To participate, dial 1-800-269-4378 and provide the password: "Frick." You may also have to give your name and list your organization. Have fun!